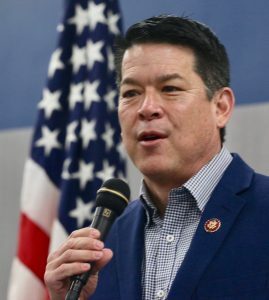 Landing in the belly of the beast, Congressman TJ Cox decided to conduct his first Town Hall in Hanford. Cox represents the 21st District comprising Kern, Kings, Fresno and a slice of southern Tulare County. Though Cox enjoyed a decisive victory in Kern County, he lost to Hanford’s favorite son, former Representative David Valadao in Kings County, a prevailing reason why he decided to hold this event in the county seat. Except for a few expected cat calls such as “You will raise taxes because you are a Democrat,” the town hall was a success with a full crowd assembled at Hanford West High School’s cafeteria. Approximately 150 well informed constituents gathered to ask questions about taxes, Medicare, water, student loan debt, and veterans’ lack of access to health care, among other issues. Audience members wrote their questions down as they filed into the cafeteria and Cox answered them on stage along with some follow up questions yelled out by the crowd. Not a word was mentioned about the Muller Report just released the night before; the discussion mostly revolved around water and taxes. Cox said that he intends to invest in Kings County’s surface water, groundwater and above-ground water storage infrastructure. He also said the conveyance system needs money for repairs and improvements. As a member of the House Committee on Natural Resources, Cox oversees federal works such as the Central Valley Project and major dams. One of his goals is to get the chair of the committee, Raúl Grijalva, (D-Arizona) to the Central Valley so he can understand the county’s water needs. He said that the committee found a fund that has been left untapped to fix Bureau of Reclamation facilities, which include Pine Flat and Shasta Dams. That fund has been banked, according to Cox, for the last 47 years and amounts to $10 billion. Right now they are committing $3 million to fix subsidence damage on the Friant-Kern Canal, of which Cox has toured the entire length. Cox has also been working with San Luis Reservoir and Shasta Dam to ensure that Westside farmers do not have to put their land out of production because of a lack of water. An audience member shouted out asking why Cox had not signed HR 1600, a bill that would transfer federal funding from the high-speed rail to water infrastructure projects. The bill was introduced by Kevin McCarthy(R –Bakersfield) and signed by all seven of the Republican members of Congress from California. Cox responded by saying that, once money is allocated to one project, Congress can’t just take it and use the money for something else. He also said he is not a believer in the philosophy of scarcity. The Federal Government can find a way to pay for transportation and the water infrastructure he said. Are you going to raise our taxes? “That’s irresponsible,” Cox said during the town hall. He said there needs to be more of a balance between what the government brings in and what it spends. Cox also said that people who were expecting a tax refund are now going to have to pay taxes because of the new bill. Along with the fact that the government was shut down for a month, Cox has introduced a bill to extend the time to file your taxes from April 15 to May 20. If Cox has been anything, he’s has been accessible–unlike his neighbor, Congress Member Devin Nunes, who has not been heard from since the election except to file a lawsuit against Twitter. In Cox’ first 60 days he has held 100 events, giving his constituents unfettered access. We middle class workers are tired of you Democrats taking and taking. We just started getting money thanks to our President. Tired of all the lies. If you are tired of all the lies, you should be pretty tired of the man in the white house!! I am tired of all politicians; Democrats and Repubicans. I am especially tired of the media outlets feeding us BS! Why should the US taxpayer pay to repair the Friant Kern Canal when the water users that it serves are undermining it by sucking the groundwater dry underneath it and causing land subsidence? Why should we listen to a rich BS artist like Cox? These socialists are all the same. They want to tax us all into poverty for the sake of welfare recipients and illegal immigrants. The rest of us can **** ourselves according to you. Saul, “Friant Kern Canal water users are undermining it by sucking the groundwater dry underneath it and causing subsidence?” I would say your exaggeration needs to be exposed here. Orange Cove, Lindsay, Strathmore, and portions of Porterville locally rely on the Friant Kern conveyance for municipality water. Those cities have grown substantially since 1951. With that growth and California turning a blind eye to central valley population growth has caused stressors and over demand on the water supply today. This is no one’s fault but the ignorant bureaucrats. Just as I pay for the failures of our educational system, DMV, and High Speed Rail, you will help pay for fixing the subsidence of the Friant Kern because it is the right things to do for sustainable future of California and the food supply. Yes, Friant Kern Canal water users are breaking their own conveyance by groundwater overpumping. That’s a simple truth. Zero exaggeration. Your irrelevant statement about Lindsay, Orange Cove, and Strathmore (you are wrong about Porterville) does not change the fact that water users are the ones who should pay for the conveyance that brings them water. That includes the municipal water users. Saul, so the population growth of the stated communities, coupled with Southern California have had zero stress or demand on the Friant Kern water system? Not to mention 1 in 5 jobs are tied to Friant Kern system on the eastside according to Hurtado, her words not mine. I would say that is relevant and substantial. Interesting how you avoid comment on the educational system, high speed rail, and DMV debacle and failures. Friant Kern Canal water users are breaking their own conveyance by groundwater overpumping. Read it as many times as you need to understand it. I am assuming that all the commenters posting here actually took advantage of the opportunity to attend the town hall meeting to share these same opinions with Mr. Cox. So what did he say in response? Barbara, I cannot afford to drive to Hanford. Your party raised my gas tax, my registration tax, and the infrastructure to get to Hanford would screw up my vehicle causing another $850/yr, coupled with I would be required to cross over those bridges that have been deemed deficient. To bad the high speed rail is only running north and south and not east to west, then I could of rode it. Too bad you can’t go to Hanford. The last time I went it was a delight, with the upgraded 4-lane Highway 198 being a vast improvement over the 2 lane road of the past and CHP handing out speeding tickets like candy. This is part of what gas taxes pay for, although I have a lot of condemnation of the raids on the funds that have happened. Post your phone # and I will offer you a ride next time I am going. Did you all read the Bee today? Apparently Cox has several holdings that he just sort of forgot to mention. Just another political sleaze bag. The people of Hanford were incredibly stupid to have voted for him. Really? Trump repeatedly lied about his business plans with Putin’s Russia and you are concerned with late filings from a nonprofit sports foundation in Fresno? Don’t misunderstand. I definitely think that nonprofit sports foundations should provide timely and accurate disclosures. I just think there are far more important things going on. Just like a Democrat. As long as the crooks are on your side, who cares? We expect stupidity from liberals. Valley Voice here is a journalistic lead to write about Cox if you set aside your biases and selective journalism. Looks like you boy Cox has some lien issues.